In a court filing on Wednesday, five major U.S. book publishers objected to the penalties proposed by the Department of Justice against Apple's e-book business, saying the program would change the terms of their respective settlements with the government. The publishing houses argue that the DOJ's proposed five-year ban on Apple's so-called "agency model" deals would negatively impact defendants which settled the e-book antitrust case, reports The Wall Street Journal. HarperCollins, Hachette, Simon & Schuster, Penguin Group and Macmillan all settled prior to the Justice Department's trial. "The provisions do not impose any limitation on Apple's pricing behavior at all; rather, under the guise of punishing Apple, they effectively punish the settling defendants by prohibiting agreements with Apple using an agency model," the documents read. 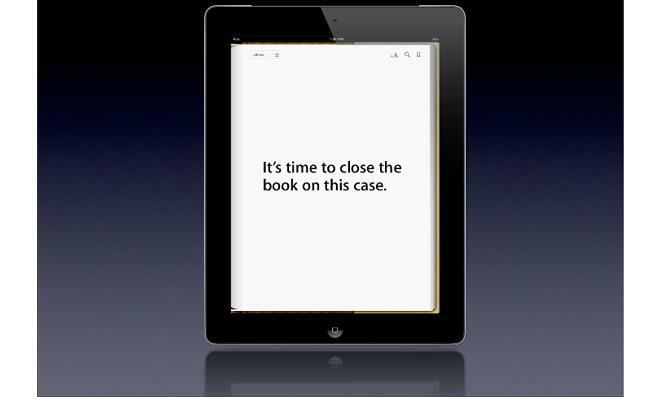 Apple was found guilty of e-book price fixing in July, with the U.S. government saying the company colluded with book publishers to falsely inflate the price of content sold through the iBookstore. Most of the trial centered around agency model pricing, which allows book publishers to set their own prices under a most-favored nations clause that precludes them from selling the same content elsewhere for less. Under the terms of a proposed settlement from the DOJ, Apple would not be allowed to enter into agency model agreements for five years. This, the book publishers say, hurts Apple less than it does the parties that settled. For its part, Apple called the proposal a "draconian and punitive intrusion" on its iBookstore business and plans to appeal the ruling. Confusing the situation further, the proposed settlement also suggests that Apple be prohibited from entering similar agreements with sellers of "music, movies, television shows or other content that are likely to increase the prices at which Apple's competitors may sell that content." This would extend the proposal's scope far beyond the iBookstore.